Hot dram! It’s finally fall whiskey season! While wearing out the last, sweaty steps of summer footwear to pick up some locally harvested apples at the farmer’s market and enjoying those resplendent late day rays of golden light that only occur this time of year, I am also excited the moment has come to be acquainted with some new whiskey. One of the most anticipated releases of the year is undoubtedly the 2017 Antique Collection from Buffalo Trace - five rock star bourbons and ryes that vary each year because the whiskeys are selected from unique barrels stored across different warehouse locations that present individual climate conditions. The whiskeys also each differ in age statements, recipes and proofs. Like foliage and pumpkin spiced pumpkin seeds, we can look forward to these super limited edition lovelies to appear each year in early autumn. However, because yields of these specially selected whiskeys tend to be low, they are highly allocated to just a couple of bottles each at most on and off premise locations. As a yearly reminder, retailers typically have a wait list. 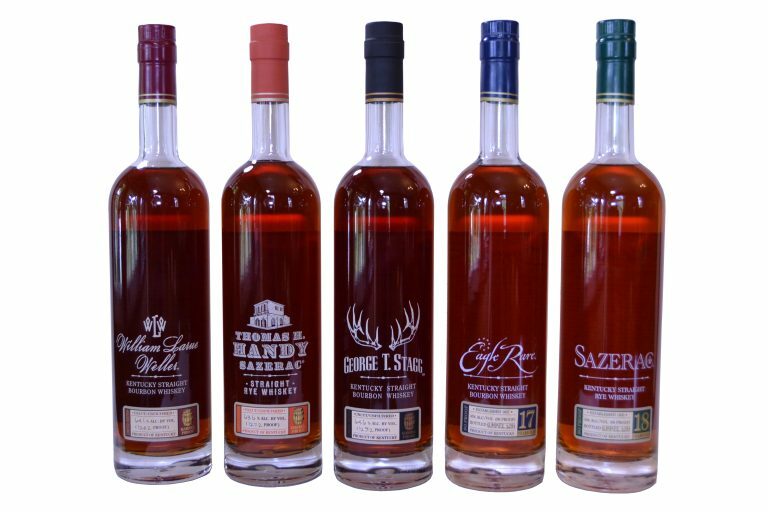 The suggested selling price set by Buffalo Trace is $90 per bottle of each expression, but because demand is always high, prices are typically set much higher by the discretion of individual establishments to match the demand. You know you’re in a good whiskey bar when they stock them for a special pour. I recommend looking out for these. Sazerac Rye 18 Year Old, 90 proof: This whiskey is drawn from barrels filled in the spring of 1998 and put in stainless steel in 2016 to halt further aging prior to bottling. This is the perfect autumn whiskey, bursting with fresh orchard apple, pear and baked plum flavors. A subtle herbaceousness tempers the sweetness along with baking spices. It’s fitting this whiskey was born the same year as P.J. Harvey’s Is This Desire? album, as it is likewise a fine mix of melody and finely tuned edginess. Thomas H. Handy Sazerac Rye, 127.2 proof: This whiskey is named for the 19th century New Orleans bartender credited with using rye as the base spirit of the Sazerac cocktail instead of Cognac. Unlike its sibling, this one is uncut and unfiltered, hence the stronger proof. The whiskeys for this year’s release was distilled in 2011, and drawn from barrels resting on the third, fourth and fifth floors of warehouses K. L and Q. It’s a rich and comforting expression of rye that is more herbal than it is spicy. Warm notes of honey, buttery pound cake, milk chocolate, black pepper, clove, nutmeg and caramel are accented by thyme and rosemary. Eagle Rare 17 Year Old, 90 proof: This year’s edition was aged on the first, second and third floors of warehouses C, K and P. This is a very simple, unfussy and elegant sipper with red apple, banana, caramel, vanilla and cinnamon notes that ends in a pleasant leathery finish. While it's not a terribly exciting whiskey, it shows such classic flavors and aromas that it feels like being re-acquainted with an old friend. William LaRue Weller, 128.2 proof: This is the collection’s celebrated uncut and unfiltered wheated bourbon recipe, distilled in the winter of 2005 and aged in warehouses D, I and P. There’s always a fascinating complexity to this whiskey and this outing does not disappoint! It’s perhaps more herbal and spicy than usual, with loads of cedar on the nose. It’s quite rich, rounded and concentrated with intriguing flavors of black tea and a balance of sweet, fruity and tart that reminds me of dark chocolate-covered figs. A bit of salinity rounds out the long finish. George T. Stagg, 129.2 proof: Always a big bruiser, this bourbon is also perennially the most popular, which makes it the hardest to find in the wild. This year’s release is from barrels filled in the spring of 2002, stored in various floors of warehouses C, K, M and Q. Drinking this whiskey is a bit like having a Hell’s Angel deliver a fruit pie on a warm day - the nose is all musty, sweaty leather (in a good way), but the palate is all stewed plums, buttery pie crust and caramel richness. The finish manages to be long but also bursting with juiciness.